Life is simple, but it is the us and the people around who strive to make it hard on a day to day basis under the pretext of our assumption that, such is life and it has to be made interesting. Are we really making it interesting or simply messing it up with various material expectations? We all will agree that "simple" is ordinary, but can't we make simple interesting? Do share your thoughts on this in the comments below. I recently read a book titled, Que Sera Sera, written by debut author Kaasyapa. Kaasyapa is the pen name of Parsa Venkata Ramchandra Rao who is an avid bird watcher and interested in various art forms, now based in Hyderabad and is an active blogger. The tagline of the book Que Sera Sera is Whatever Will Be Will Be and that's the exact essence of the book. It doesn't fail to convey the same. 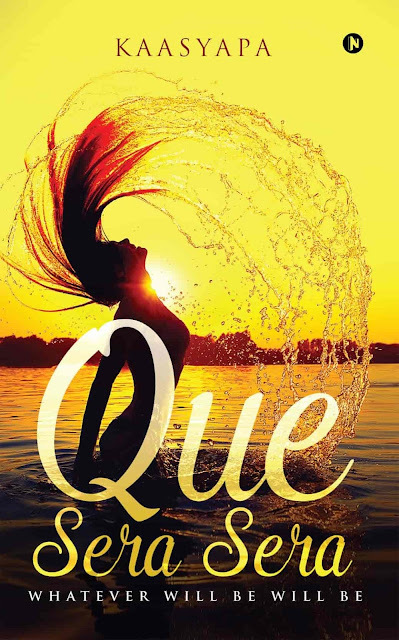 Que Sera Sera is a story set in the sixties and revolves around the life of Sagar from his younger days as a college graduate to his job search and the professional success that follows him. He sees betterment in personal life as well, finding the love interest that would last for a lifetime and his adventures even in an age that is perceived as an old age. The story is too close to everything that appears to be perfect or a desired life in simpler words. Overall, the book is very positive in its approach, the choice of words and the perception of life because whatever will be will be! Que Sera Sera is true to it's title and always keeps a smile on your face, it will make you surf through what we call the old world charm which we, the recent generation, could never experience. We have heard how the life in post-independence India was, Que Sera Sera just reaffirms the same. Young legs seeking a public sector job which assures job safety and respect, the glory of possessing a car back then and finding true love which existed in the non-existent tech gadgets. Que Sera Sera is more about the values that persisted back then, the people and their needs, a modern outlook towards life and the constant hunger of success, but not at the cost of something else. The protagonist, Sagar, lands with a job at the Indian Oil Company, thus the majority of the story revolves around it and gives the reader on some insights about one of the public sector giant. There are many good things about the book Que Sera Sera, one of which are the graphic illustration at crucial points which make the story appear realistic, though fictional. The writing is very simple, positive choice of words and no drama continuously maintain the uniformity. The book is devoid of too much detailing, which is a good thing and the minimal characters in the story keep it simple. But then, this simplicity is not something that everyone may like, so use for discretion while picking up the book.